Contact The White House: Tell Obama "Visit Dimock!" | Stand With Dimock! Contact The White House: Tell Obama "Visit Dimock!" Invite your Facebook friends to the Event! 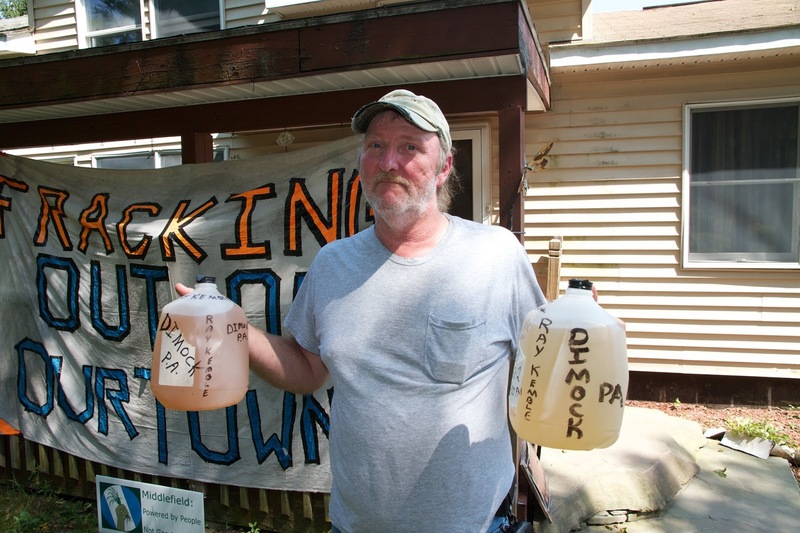 As some residents of Dimock, Pennsylvania approach five years of living with contaminated water due to natural gas drilling, President Obama is scheduled to pass by on his bus trip from Binghamton to Scranton this Friday. The residents want to 1) show the President in person their water quality after drilling and fracking, 2) tell him to re-open the EPA groundwater study that was canceled during the 2012 campaign, and 3) request EPA's water deliveries to contaminated homes under the Superfund Law, which were also canceled last year. Ask them to schedule a visit to Ray Kemble, where drilling is underway 500' from his house, Carter Rd in Dimock Township, where water wells produce so much methane residents can light it on fire, and a toxic tour with local grandmother Vera Scroggins as the President travels south on interstate 81. The White House can contact Vera at 607-237-9685 for arrangements. Last week, Dimock resident Ray Kemble and his neighbor Craig Stevens traveled south to Scranton's Federal Building, EPA Region 3 offices in Philadelphia, and EPA Headquarters in Washington to deliver 50,000 signatures demanding the EPA re-open ground water studies in Dimock PA, Pavilion WY, and Parker County TX while providing water to impacted households under the Superfund Law. In July, Gasland II director Josh Fox also authored an open letter to President Obama asking for visits with impacted residents. The White House has still not responded to either ask. Let's stand with Dimock and demand a visit to Dimock, re-opening of the groundwater studies, and water deliveries with a permanent solution in mind.